AYLMER, ONT – On Wednesday, the Canadian Olympic Committee (COC) and Cycling Canada named the 19 athletes nominated to represent Team Canada in all cycling disciplines at the Rio 2016 Olympic Games from August 5 to 21. Among the elite group of cyclists nominated are Olympic medallists Tara Whitten and Jasmin Glaesser as well as returning London 2012 team members Catharine Pendrel, Laura Brown, Emily Batty, Tory Nyhaug and Monique Sullivan. The team also includes Georgia Simmerling, who competed in alpine skiing at Vancouver 2010 and ski cross at Sochi 2014. 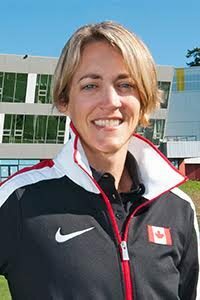 She looks to become the first Canadian athlete to compete in a different sport at each of three Olympic Games. The team is coached by Craig Griffin (track – endurance), Erin Hartwell (track – sprint), Adam Muys (BMX), Denise Kelly (road – women), Pierre-Henri Sauze (BMX) and Dan Proulx (mountain bike), all of whom are overseen by High Performance Director and Head Coach, Jacques Landry and High Performance Manager, Kris Westwood. The athletes earned their spots as part of a two-year qualification process during which their accumulated ranking points qualified Canada for the Games in each discipline. After an extensive review of international performances, physiological data analysis and other determining factors, the High Performance Committee selected the nominated athletes to compete at the Games. The Rio 2016 cycling competitions will take place at various venues. Road cycling will be held on August 6 and 7 at Fort Copacabana and August 10 in Pontal. Track cycling events will be held at the Rio Olympic Velodrome, August 11-15. The BMX competition will take place at the Olympic BMX Centre, August 17-19, followed by the mountain bike races August 20-21 at the Mountain Bike Centre.